The Asia LEDS Partnership is a voluntary regional network comprised of individuals and organizations from the public, private, and non-governmental sectors active in designing, promoting, and/or implementing LEDS in Asia. It is one of four regional platforms of the LEDS Global Partnership,1 an initiative of more than 120 countries and international programs launched in 2011. 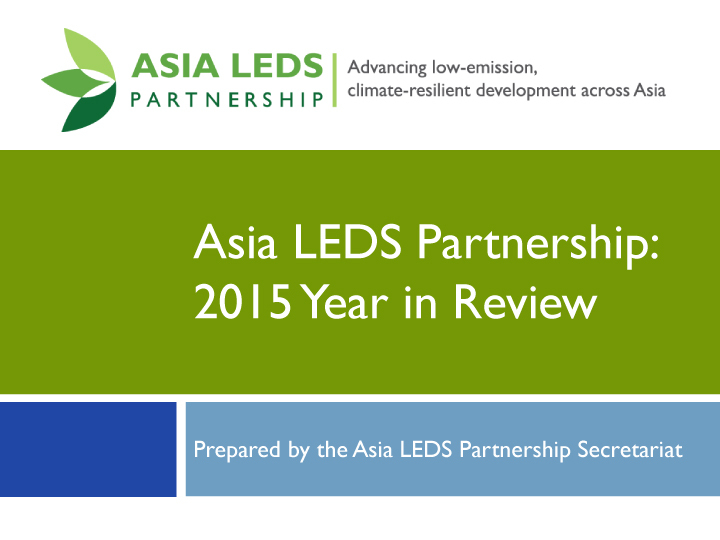 The Asia LEDS Partnership vision is an Asia and Pacific region with robust economic progress and low greenhouse gas (GHG) emissions, with countries adopting and implementing LEDS and green growth practices. 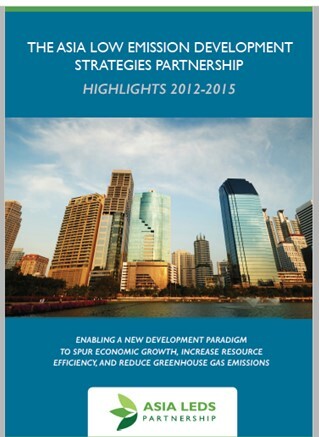 The Asia LEDS Partnership goal is to advance the development of country-led and country-specific strategic plans to promote economic growth while reducing GHG emissions—without causing trade-offs to other environmental pressures—in the Asia region. Coordination, collaboration, and partnerships: Facilitate enhanced collaboration among governments, development organizations, NGOs, businesses, academe, and others actively engaged in LEDS in the region, including work to maximize results while minimizing duplication. Tools and best practices: Identify and disseminate tools, models, approaches, and best practices in priority LEDS topics to enable peer-to-peer learning and application across the region. Capacity building: Foster capacity building of practitioners to make Asia a leader in designing and implementing LEDS and green growth. Leadership and awareness: Strengthen support for LEDS across Asia by inspiring and catalyzing leaders of change and raising awareness about the benefits and methods of promoting LEDS. The geographic focus of the Asia LEDS Partnership includes countries within the sub-regions of East Asia, Southeast Asia, South Asia, Central Asia, and the Pacific (including Australia and New Zealand). 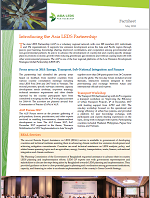 Members of the Asia LEDS Partnership comprise individuals and organizations working within the public, private, and non-governmental sectors to advance low emission development in Asia. This includes members from both developing and developed countries as well as international partners supporting LEDS in Asia from any region around the world. The Asia LEDS Partnership is led by two Co-Chairs (noted below) and a Steering Committee, comprising the organizations listed below. ICLEI – Local Governments for Sustainability serves as the Secretariat. Download the Asia LEDS Partnership Terms of Reference for more details on the network’s governance structure, and roles and responsibilities of organizations involved in governance and/or as members. Photo of the Steering Committee that served for the 2013-2014 period. Members of the Asia LEDS Partnership are individuals and organizations within the public, private,and nonprofit sectors working to advance low-emission development in Asia. This includes, but is not limited to, Asian government ministries and departments, development organizations, non-governmental organizations, technical or research institutes, and businesses. Membership is voluntary. The Asia LEDS Partnership has developed Branding Guidelines that provide details on use of the ALP logo for branding and co-branding activities and materials. Asia LEDS Partnership members, and in certain situations third parties, may use the Asia LEDS Partnership Brand Elements after receiving written permission from the Asia LEDS Partnership Secretariat. Click here to learn more about the ALP branding guidelines. To share your comment or to request more information about the Asia LEDS Partnership, please send us an email at: alpsecretariat@iclei.org. The LEDS GP was founded in early 2011 to enhance coordination, information exchange, and cooperation among those working to advance low emission growth around the world. The LEDS GP brings together more than 120 governments and international institutions. The main work streams of the LEDS GP are (1) Tools and Analysis, (2) Finance, (3) LEDS Process, and (4) Sectors. A small Secretariat, comprised of the National Renewable Energy Laboratory (NREL) and the Climate and Development Knowledge Network (CDKN), supports global activities and coordination. More information is available at: http://ledsgp.org.